The NSW Government are marking the 50th anniversary of the National Parks and Wildlife Service (NPWS) with a massive restructure that will cuts jobs and push hundreds and hundreds of years of experience out the door. The Berijiklian Government is overseeing the scrapping of 13 highly experienced Area Managers – who have a critical role in bushfire management. In recent years NPWS has downsized from 66 areas across the state to what will be just 37 under this latest restructure. Due to the current restructure, Pest Management Officers and Fire Management Officers have been slashed across the state with the new structure containing just eight PMOs. These cuts to specialist roles mean fewer conservation programs, reduced maintenance of facilities and fire hazard reduction, less focus on dealing with pests and weeds, and the increasing problem of wild dogs and deer. Admin support has been downgraded all across the state resulting in loss of crucial regional jobs and in many cases, massive wage reductions. With wage growth at all time lows, the impact of this restructure will be felt hardest in the regions. These cuts are being made because of the massive reduction in funding from the Berejiklian Government, with 121 million dollars slashed from their budget. To register your opposition to these cuts, you can contact your local member HERE. Some photos from the rally at Bega on 24 November to protest against the dramatic cuts in the National Parks and Wildlife Service. Events across the state condemn a massive restructure the National Parks and Wildlife Service (NPWS). 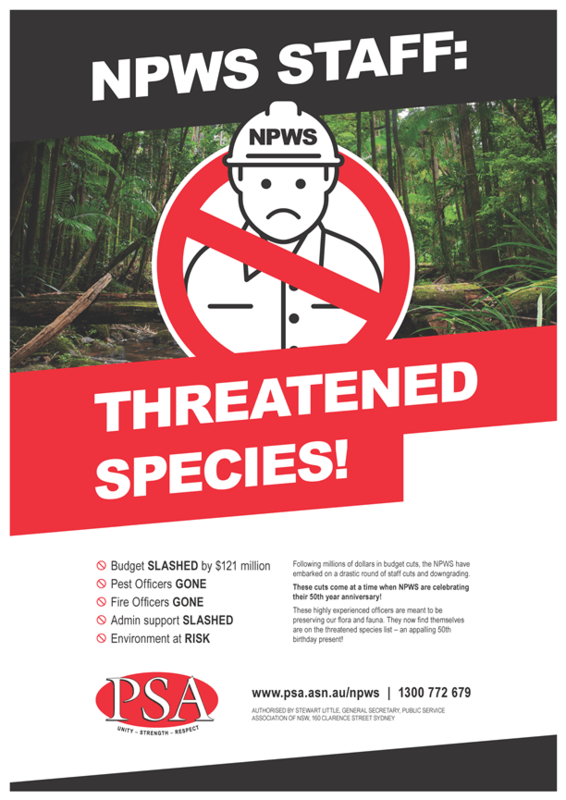 PSA members at events in Katoomba, Queanbeyan, Grafton, Griffith, and Wollongong on 19 October drew community attention to the massive restructure of NPWS that will cut jobs and jeopardise public safety. National Parks and Wildlife members showed there is strength in numbers (and onesies) today at Katoomba. Members from the National Parks and Wildlife Service in Wollongong took a stand today as did others, in regional areas, against job cuts under a massive restructure.